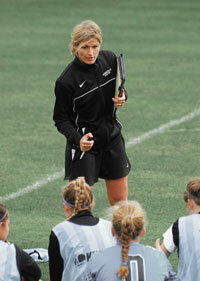 Jen Hughes is in her 13th year at the helm of the Amherst women’s soccer program. She has compiled a 155-45-29 record and has led the program to 2 NESCAC Championships and 9 (6 consecutive) NCAA Tournament appearances. In 2016, Hughes guided the team to a 17-3-1 record, a NESCAC Championship, and an NCAA Sweet Sixteen appearance. During her tenure, Hughes has coached 12 All-America selections, 4 Academic All-America selections, 33 All-Region selections, 3 NESCAC Players of the Year, 2 NESCAC Rookies of the Year, and a host of All-NESCAC selections. 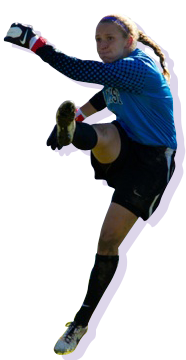 Hughes has an Advanced National Diploma from the NSCAA, an MBA and M.S. in Sport Management from UMASS, and a J.D. from UCONN. Hughes was an All-America, three-time All-Region, and four-time All-Patriot League selection at Colgate University. Staff list will be updated as additional staff is added. Staff will also include current members of the Amherst women's soccer team.